The purpose of this study is to evaluate the implementation of inclusive education policy in Salatiga City. This study used a qualitative evaluative approach to the research subject of Dinas Pendidikan and inclusion schools in Salatiga. In-depth interviews, document studies, and observations were used to collect data and then analyzed using an Edwards III implementation model that looked at communication, resource, disposition, and bureaucratic structure. The results showed that the implementation of inclusive education policy in Salatiga is considered good, that is the achievement of 65%. Communication is an aspect that requires a lot of improvement, as well as the bureaucratic structure and disposition that is still not a good implementation. While the best aspect is the resources. The impact of this policy is evident from the increasing number of students in regular schools from year to year and the reduced discrimination experienced by ABK students by peers, teachers and the community. Edward III, George C. 1980. Implementing Public Policy. USA: Congresssional Quarterly Inc.
Sartika, Dwi dan Ismanto, Bambang. 2016. Evaluasi Penyelenggaraan Program Pendidikan Inklusif di Kota Palangkaraya. Jurnal Kelola 3 (1): 49-66. Haryono, A. S. 2015. Evaluasi Pendidikan Inklusi bagi Anak ABK di Provinsi Jawa Tengah. Jurnal Penelitian Pendidikan. 32 (2):119-126. Nakagaki, M. 2013. Closing the Implementation Gap. CIPE Economic Reform , June (15): 1-8. Sulasmono, B.S. dan Yanuet Indah Z.T. 2015. Evaluation of Inclusive Education Program for Slow Learners in SD Negeri Pulutan 02 Salatiga. International Seminar "Quality Assurance For Education Proceeding. Yogyakarta: UST Sarjanawiyata. Sulasmono, B.S. dan Tri Sulistyowati. 2016. Context, Input, Process and Product Evaluation of the Inclusive Education Program in Public Elementary School. ICERI 2016 Proceeding. Yogyakarta: Universitas Negeri Yogyakarta. Wahab, S. A. 2015. 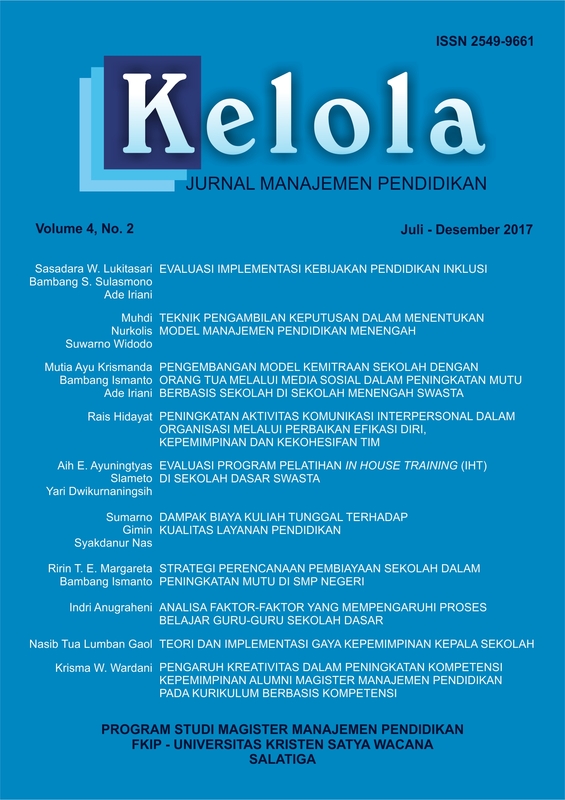 Analisis Kebijakan: Dari Formulasi ke Penyusunan Model-Model Implementasi Kebijak an Publik. Jakarta: Bumi Aksara. Walker, Jo. tth. Equal Right, Equal Opprtunity. Inclusive Education For Children With Disabilities. Global Campaign for Education, Handicap International. Widodo, J. 2011. Analisis Kebijakan Publik. Malang: Bayumedia. Zakia, Dieni L. 2015). Guru Pembimbing Khusus (Gpk): Pilar Pendidikan Inklusi. Prosiding Seminar Nasional Pendidikan “Meretas Sukses Publikasi Ilmiah Bidang Pendidikan Jurnal Bereputasi” Kerjasama Program Studi S-3 Ilmu Pendidikan Program Studi S-2 Pendidikan Luar Biasa Universitas Sebelas Maret Surakarta dan ISPI Wilayah Jawa Tengah. Surakarta. ______.Salatiga Miliki Unit Layanan Konsultasi Pendidikan. (2013, Desember 2). Wawasan , p. 23.